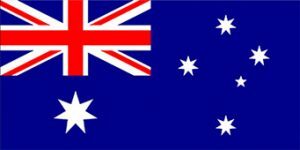 Max ATV Australia was started in April 2007 to fill a void in the Australian market for high quality durable amphibious vehicles for mining, government and recreational users. We pride ourselves in supplying specialist vehicles tailored to meet the exact needs of our customers. Since our humble beginnings, we have expanded our range to include not only Max and Mudd-Ox, but also the Australian made Tomcar range of side by side utility vehicles. Our customers range from Exploration and mining companies, cattle stations and recreational users and families wanting to explore the great outdoors. We believe we have a vehicle for almost any situation whether it be extreme mud/ soft terrain, or rough, rocky steep country. We offer full warranty and spare parts for everything we sell, and can be reached 24/7 for your convenience, should you have any questions or need any technical assistance. We can arrange finance and shipping to anywhere in Australia, and regularly attend field days and agricultural shows around the country. Our vehicles have consistently proven themselves in some of the most challenging conditions Australia has to offer, and with the release of the new Mudd-Ox Vengeance range, affordability has never been better. If you are looking for a vehicle to take you places you only ever dreamed of going, check out the range at Max ATV Australia. 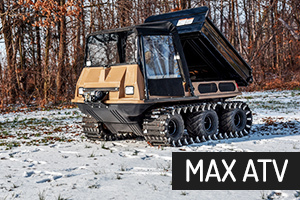 The 6-wheeled MAX ATV is an extremely maneuverable, lightweight and cost-effective product with a simple, robust and technically superb skid-steering mechanism and the lowest ground pressures in their class. 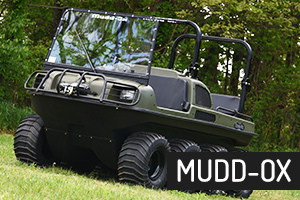 Mudd-Ox are an 8-wheel all terrain vehicle, or as we like to call it, an ultra terrain vehicle, as there is no surface this machine cannot dominate: hills, mud, dirt, sand, snow and water. Great for personal or work use. 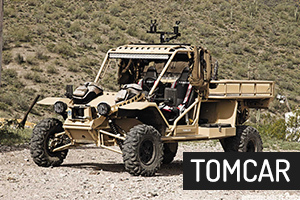 The Tomcar is an extremely versatile and tough vehicle that comes in 2 and 4 seater combos, and even comes in a ute model for those needing work done in remote or harsh terrain.